The following proposal developed by Dr. Guillermo Valle denotes the objectives, expected results, beneficiaries, and budget costs to establish a 10-hectare demonstration system on the FUNAVID watershed. CURLA National University and FUNAVID believe this demonstration project will serve as the beginning point to affect change in hillside cultivation practices within the 24-km study area. Implement an alley cropping system with guama that allows participatory research with agricultural producers of the area with different crops they choose so that they learn by doing and adopt the system for their plots and promote the system with other producers at the same time. • Establish an area of 10 hectares with the guama alley cropping system at the Fundación Vid land in Balfate, Colón, with single and double rows of guama and mixed with other species with different spacing between rows.• Plant in a participatory manner with regional producers corn and beans and any other crops of interest to producers and quantify costs as well as document growth and yield of the same. • Compare performance of different crops with double and mixed rows and different spacing between rows. • Plan and implement field days so that the producers doing research can explain their findings to nonparticipants. • Document experiences so they can be socialized with all producers. • Train producers on soils, plant physiology and plant protection so they can understand these new agroforestry systems. • An area of 10 ha established and operating with the alley cropping guama system, that will serve as a training center for different agricultural producers groups. • Field days held with 40 producers on how to establish the guama system and cultivate the crops that show potential for the region. • A seed bank established that would provide producers with planting material when they decide to establish the guama system in their plots. • Study guides of participatory research results. • Methodological guides on establishment and management of the guama system with the different crops. 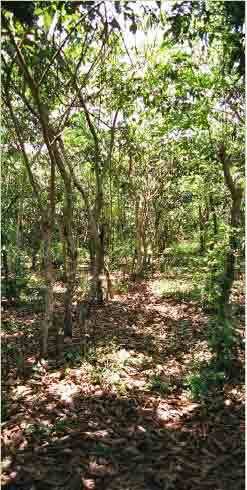 • Establishment of a guama and other tree legumes nursery as a first stage of the program. • Planting of guama and other legume trees in predetermined arrangements with different distances among rows and different mixes of multiple use trees. • Planting of the different crops with the producers so that these take charge of management, data collection and harvest, thus linking local and scientific knowledge. • Planning and implementing field days. • Compiling and publishing study and methodological guides. • 40 producers and their families, some 240 persons. • Students and professors from CURLA, who will benefit from working with a new sustainable and organic cropping system. • Students and teachers from local high schools, who can learn how to use this system. FUNAVID would than become the agriculture extension teaching school to help the indigenous farmers adopt the system to their lands. If funds were available FUNAVID could also distribute small grants to farmers to encourage adoption of the agroforestry alley cropping system.